It's been a huge few days in doggie history. First we had the feisty withdrawal of the RSPCA from Crufts, all I can say is that the post-documentary talks between the KC and the RSPCA at Clarges Street obviously didn't go very well! I'd say Mark Evans was more sure than ever that things have to change. The RSPCA announcement re-ignited the media and then the public. Even a simple appointment to get a repeat prescription at the doctors turned into marathon. My doctor, who isn't doggie, had chanced on the documentary and had been gripped by it. So had many of her patients. She said she'd never known a programme be so talked about for so long after transmission. As I wrote in the Times yesterday, it won't be long before other charities follow the RSPCA. Then yesterday we got the press release saying that Dogs Trust were pulling out of Crufts, Discover Dogs and even the MP's dog show Westminster Dog of the Year which was always co-organised with the KC. Then it seemed like moments later the phones started ringing and we had news of the Kennel Club making a surprisingly radical move. If you were hoping it was to accept all the failings and to start putting everything right you'll be disappointed. No, the KC had decided to shoot the messenger. They'd put in a complaint to Ofcom that the documentary was unfair. And, the note on their website said they were also reviewing their contract with the BBC to televise Crufts. So what will be next in the week of change? Watch this space - have rewritten whole chunks of the next magazine in the last few hours. 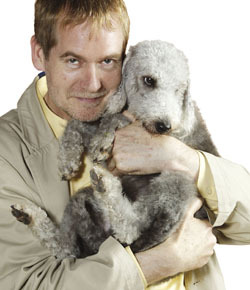 I probably should get more sleep, but I was daydreaming that trying to get the stubborn old KC to reform is a bit like another old favourite favourite BBC TV prog - One Man and his Dog. We can all see the pen quite clearly (reform) - it's the obvious place for the sheep to go, we've got loads of very able people directing the sheepdog as to where the pen is - vets, scientists, welfare organisations, anyone with a brain etc. The sheepdog (in my strained analogy) is at the moment the media. Okay, you've probably already guessed it, the sheep are the KC. But right now, the sheep just won't even look at that pen and have decided the very best plan is obviously to attack the sheepdog. But it's not just one little sheepdog (ie Dogs Today) it's the worldwide bleeding media that's shouting, "Get in that pen you silly sheep!" Obviously very few sheepdogs can actually speak, but you get my drift! Near to 300 now, please do keep spreading the word! I wonder has anyone at the KC considered what happens if (when?) Ofcom rule they haven't got a case? How devastating will that be for them? Isn't it better to admit the problems and start putting them right without further delay? A spokesman for BBC Documentaries said it stood by the programme's content. In a separate statement, the corporation said it was "seeking reassurance, on behalf of its viewers, that the objectives, practices and organisation of the breed competitions at Crufts have as a first priority the health and welfare of all dogs taking part in the competition". An advisory panel would be set up to consider "what measures the Kennel Club should be expected to take now and commit to in the future". It added: "The panel will be asked to give the BBC their advice quickly to enable the BBC to discuss the issues with the Kennel Club before planning begins for coverage of Crufts 2009." Crufts has been transmitted on BBC Two since 1966. Kennel Club spokeswoman Caroline Kisko told the BBC it was not "a tenable position" for the broadcaster to show Crufts - a programme "celebrating dogs" - when it had also aired a documentary "which was clearly so heavily biased against dogs". "All of those dogs that were shown on the programme were taken to be to do with the Kennel Club," she said. "The message put across by the programme was that all their disabilities, their illnesses, were caused by something which the Kennel Club had done, to the point where we were likened to Nazis." Ms Kisko said the Kennel Club had recognised that "things had gone too far" with some breeds several years ago and was making efforts to address their health issues.But she added: "The fact of the matter is that the large majority of pedigree dogs in the country are healthy." Hmm, not normally a betting woman but my money's on the BBC winning this one. The Kennel Club are (excuse the phrase) "barking mad". The Chief vet of the RSPCA agrees with the message of the programme, as do the Dogs Trust and all the geneticists and scentists who have worked in the field. Why do they think that an independent body reviewing the programme are going to be able to come out in support of the Kennel Club? Still, I have no objection to this review on these grounds. Aside from the fact that the KC seem to be utter idiots, as you write, the word "world" caught my eye. Here in Sweden there hasn't been a mention of the documentary. Sure, my breeder friends have heard about it from contacts in the UK and we've been talking about it; however, there's been no coverage in the media. Rest of Scandinavia has also been quiet on the subject. Lets hope magazines like yours will help get the message across. BTW. You should be Twittering your updates / news. It's a very quick way of sharing important info. I saw a "Dog to be rescued" on Twitter yesterday and thought of how you often post things here. Unfortunately the KC may have a case. At the time I felt the documentary was unbalanced in its approach to expose the problems - there were very few cases demonstrated and the documentary did not suggest or show any good practices or how the breeding world could move on to avoid what was happening in the past. It is a good thing (?) that these organisations are making a point by withdrawing their support from events like Crufts, but I know that many worthwhile stands do occur there to make people aware of what goes on in the dog world (behaviourists etc) all good people, who are not supporters or inbreeding, but use the event to reach a mass of people. If Crufts were to fold, it could potentially damage a lot of people, and in the current climate it isnt what is needed right now. The petition is a great way to raise awareness, be persistent, but be careful that there are many good people, who do not deserve to be silent victims of this. I don't agree that the BBC documentary was unbalanced. I did feel that the KC were given the opportunity to put their side of the case, and in watching it understood that they could alienate breeders if they were too heavy handed, resulting in less control not more. But I don't think they did themselves any favours at all, and most of the time they and many of the breeders came across as supercilious or just downright arrogant. I see from the BBC article today that Pedigree is still sitting firmly on the wall. But I was pleased to be able to point some very concerned dog owners to this blog and the petition on our morning walk yesterday. Well done Beverley, it's wonderful what you have done so far. Keep up the pressure. I've got the feeling there needs to be a complete overhaul of the KC, with new people at the top - people who understand the dangers of inbreeding and breeding for beauty and who are willing to take action. I have signed the Downing Street petition and will urge as many dog owners as I can to do the same. Crufts will never fold, it may go back to being more like a 'normal' dog show if nothing changes. There's a championship dog show with exactly the same awards on every weekend - it on in recent decades that its become a general doggie spectacular. I'm afraid the KC are just throwing their toys out of the pram - this is no way to deal with a crisis! They need to face up to the task ahead and stop swimming against the tide. As somebody else has trawled the net for old news, have a look at these (linked) far more recent articles. Interesting to see who is judging the Cavalier shows. An independant body will make a balanced argument, unlike the one that was shown! And as for the organisation abandoning crufts, shocking! Education people! The charities should be there to educate the public how to buy a dog, what health tests should be done, how to avoid back yard breeders and puppy farms. Oh wait, the KC already do that. FYI for every scientific arument made, there is a scientific counter-argument. Has nobody seen the puppy ads advertising cross bred dogs as healthier than the pedigrees as shown on the bbc documentary? This is what happens as a result of sensationalist journalism. I would like to see the rest of the documentary that sits on the cutting room floor, after all it is 2 years worth of work, so there must be a lot. The RSPCA pulling out is no loss to Crufts. All they did was hire a prime spot to take money from guilable dog lovers to line the pockets of the people at the top. No RSPCA centres would see a penny of it. I understand when some people here are saying that the documentary was not 'balanced', but I feel that that is exactly the point! Reporting on such an issue can not be balanced. What the documentary was doing was reporting on an issue where dogs are being bred deliberately to a life of constant pain and suffering. They were saying "wake up to this and do something about it" - to the KC and all that were watching it. The fact is that the KC themselves knew all these issues were happening and yes, they have been 'trying' to do something about it. In their own admission - they should have done something sooner. This documentary was bringing this to the forefront. We all know sometimes we can sit back on our backsides when we dont really want to do something, and it takes someone shouting at us to get up and move. That is exactly what the programme was trying to do. Hopefully now the KC will get up off their backsides and do what they are there to do... protect the dogs.